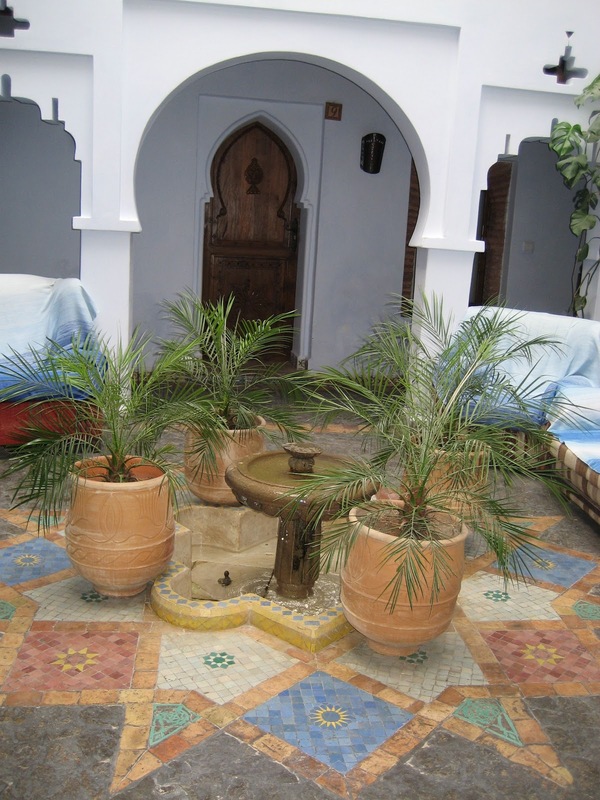 Expats in Tangier bring their very personal style to their homes. They take what's best in each country they visit or live in, mix it with what they brought from their country of origin and give their own spin to the lot. The result is often spectacular, sometimes quirky and always original. 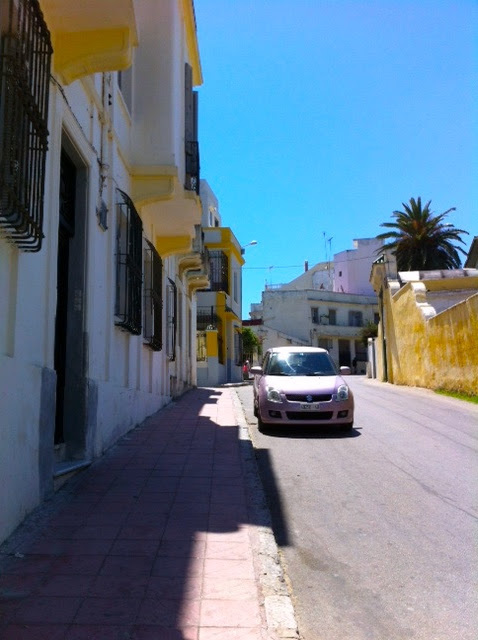 Such is the case of this english couple who spend the summer months in Tangier. The house sits in a large garden overlooking the sea and Spain beyond. 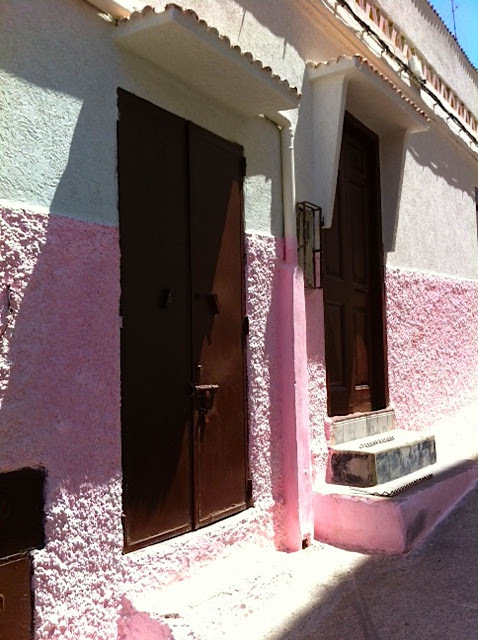 Originally, it was a rather small house that was completely refurbished. Extensions were added as well as a swimming pool. 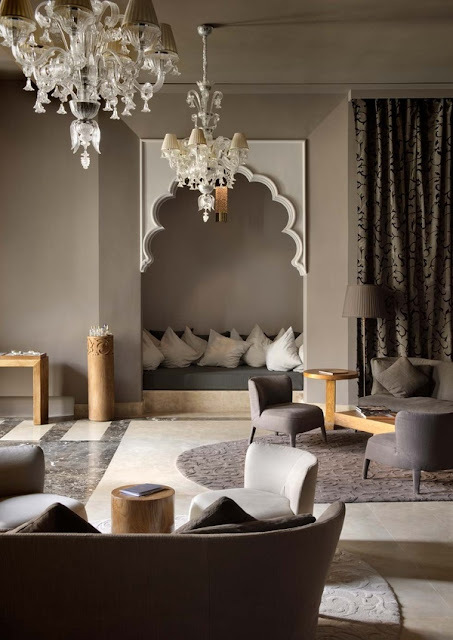 The general atmosphere is continental but Moroccan touches remind one that we are indeed not in London anymore. 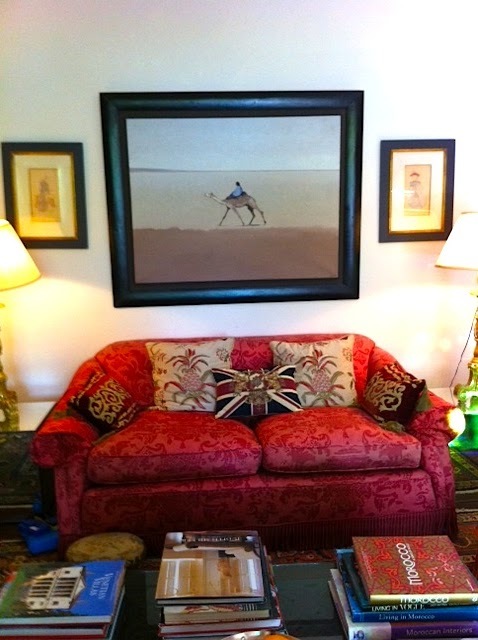 For proof, one needs only notice the contrast between the Union Jack cushion on the sofa and the modern painting of a touareg on his camel. 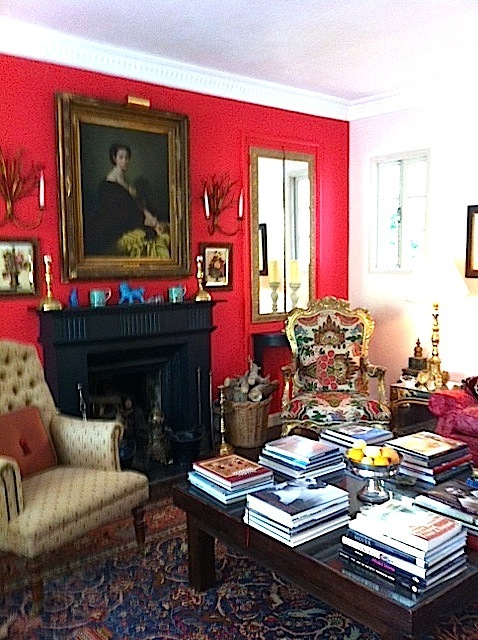 Books on European and Moroccan decor, sites to see and cuisine are piled up on the coffee table. The owner is an avid gardener who hates to see bare soil. 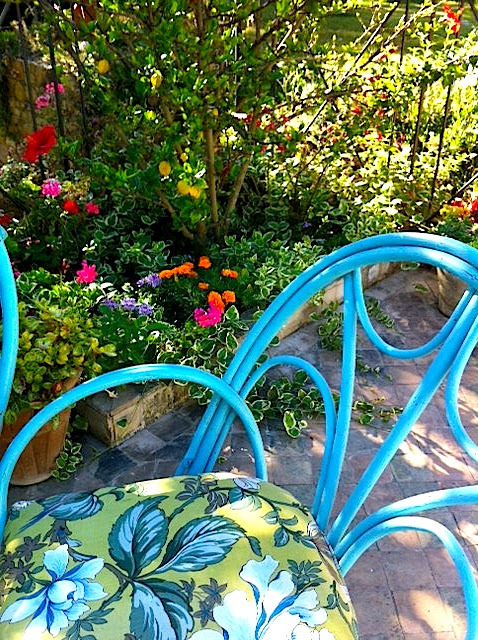 The outdoor furniture has been painted a bright cheerful turquoise and flowers fill pots, planters and flower beds. 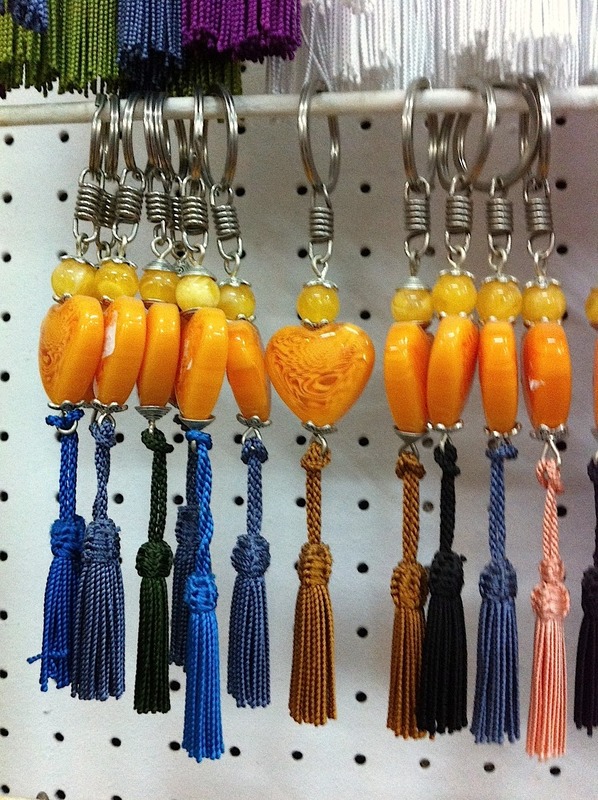 ...but everywhere are reminders that those who live here travel extensively and in fact, just returned from India. 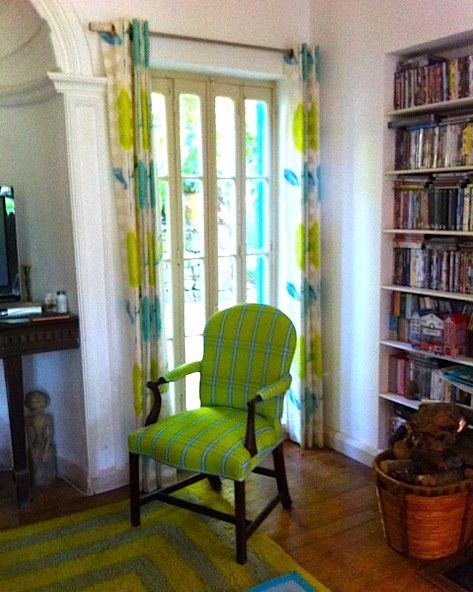 ...and done in shades of turquoise and green, very Designer's Guild. 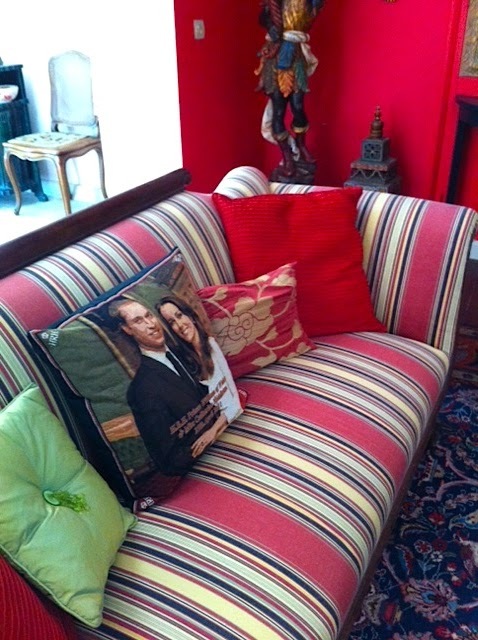 A pillow with a portrait of the young royal couple was given to the owner in jest but it gives the room quirkiness and originality and I hope they keep it there. Altogether a comfortable, lovely home with a lot of England, some Morocco and a bit of everywhere else in the world, much like their life. 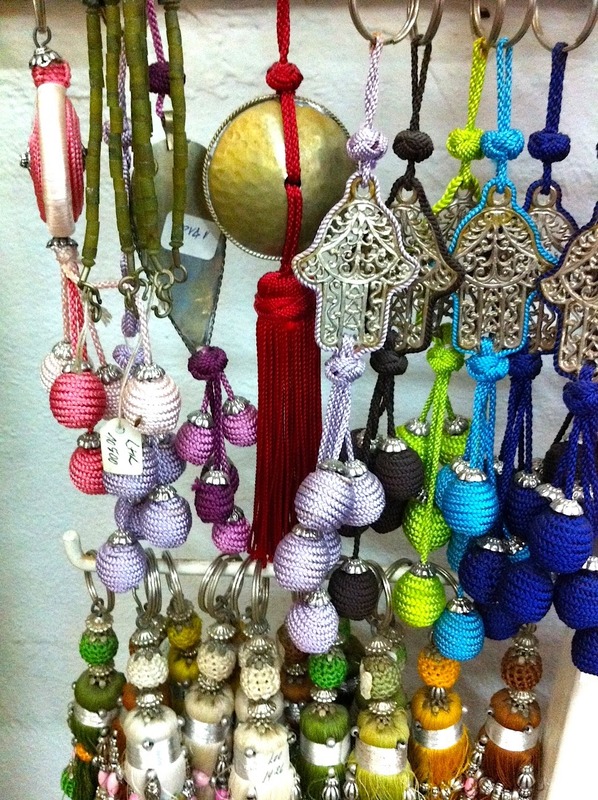 Les Merinides is a shop in the medina of Tangier where you can find real treasures made by Moroccan artisans. Hassan and his brothers are involved in the family business that started as a leather goods company. Hassan now does most of the designing. What he does not design, he finds on his numerous trips around the country. 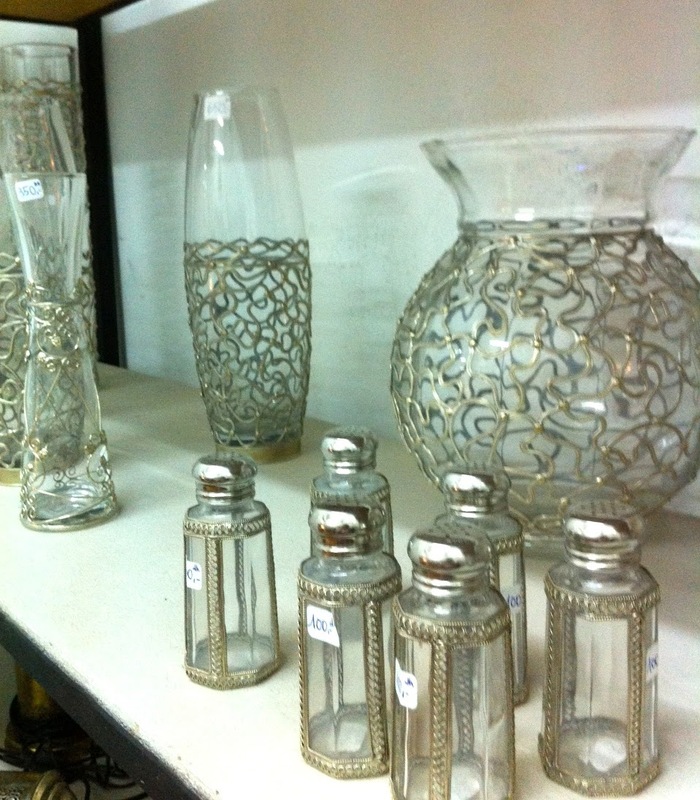 Les Merinides est un magasin de la medina de Tanger où l'on trouve de véritables trésors réalisés par des artisans marocains. Hassan et ses frères sont impliqués dans cette entreprise familiale de maroquinerie. Hassan dessine presque tout lui-même et il déniche le reste lors de virée dans le reste du pays. 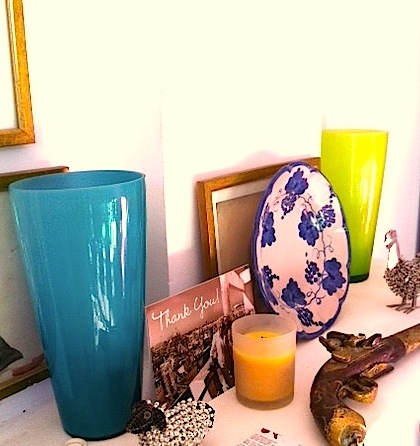 Primary colours for these lovely tadelakt and maillechort candle holders. 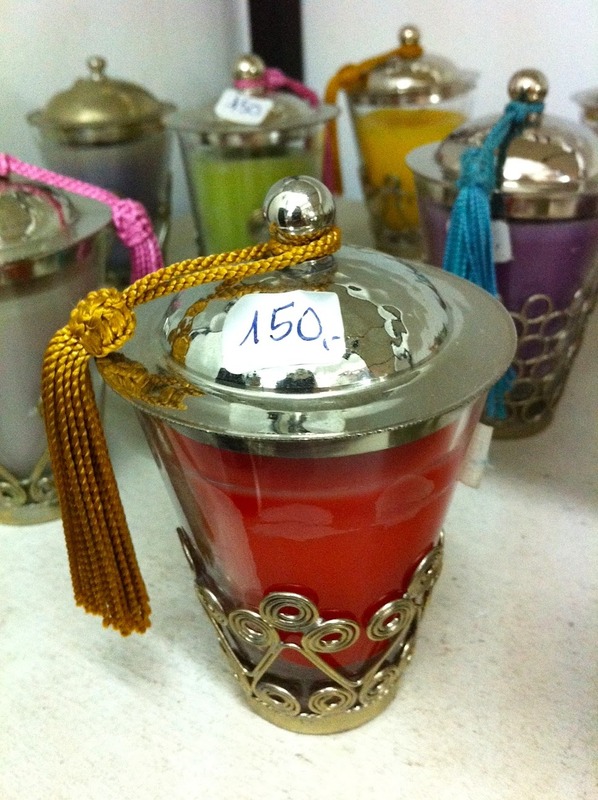 Des couleurs primaires pour ces portes bougies en tadelakt et maillechort. While some candles are made elsewhere, others below this photo are made to Hassan's specifications by a local jeweller. The price is in the local currency, dirhams. 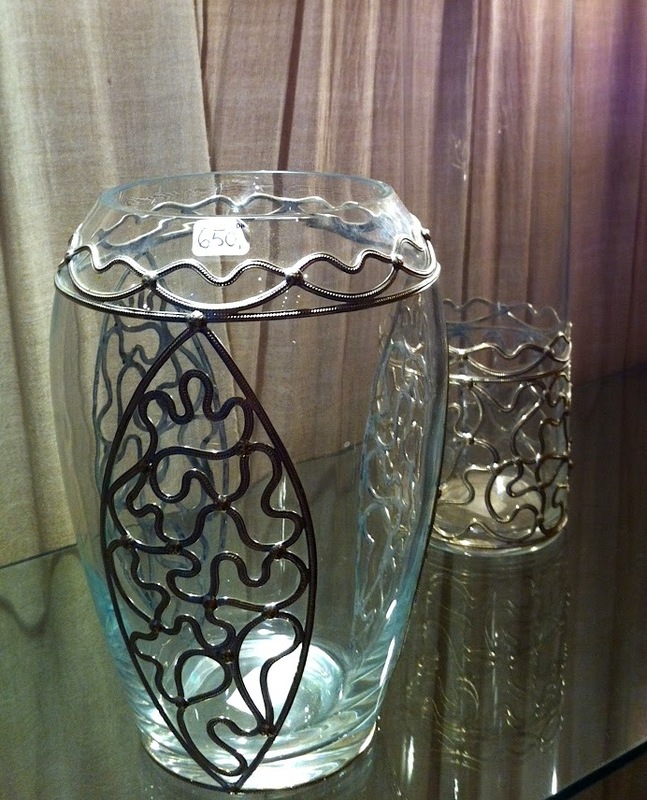 That's 13 euros (US$17 dollars) for a hand made jeweller quality candle holder, not bad! Certains portes bougies sont fait ailleurs mais celles des photos ci-dessous sont fait par un joailler local. Le prix est en dirham, la monnaie locale et correspond à 13 euros soit 17 dollars US. The key chains are not designed by Hassan but he only chooses original colours, design and textures. This is not the tourist fare usually found in the medina. Ces portes clefs ne sont pas des créations d'Hassan mais il choisit les couleurs et les matières tout spécialement. Pas de babioles pour touristes ici. 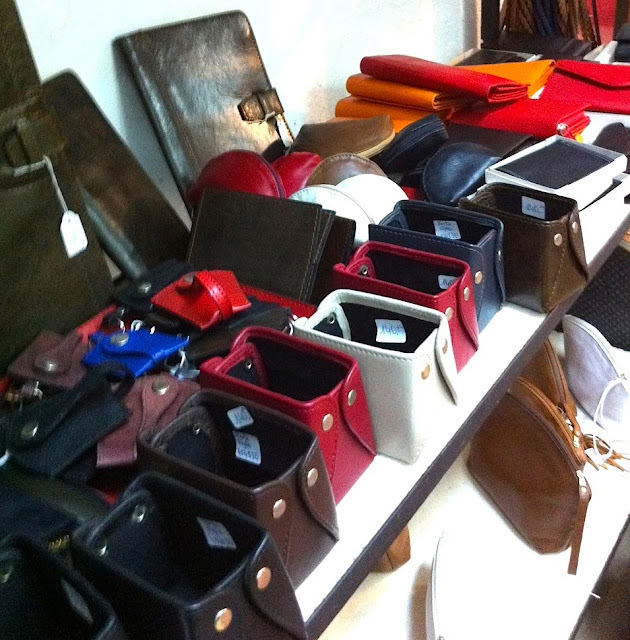 True to his family's tradition of leather making Hassan has pouches, wallets and purses made with fine leather in a rainbow of colours. Selon la tradition familiale, Hassan fait faire des petits sacs, des portefeuilles et des sacs à main en cuir dans un arc-en-ciel de couleurs. 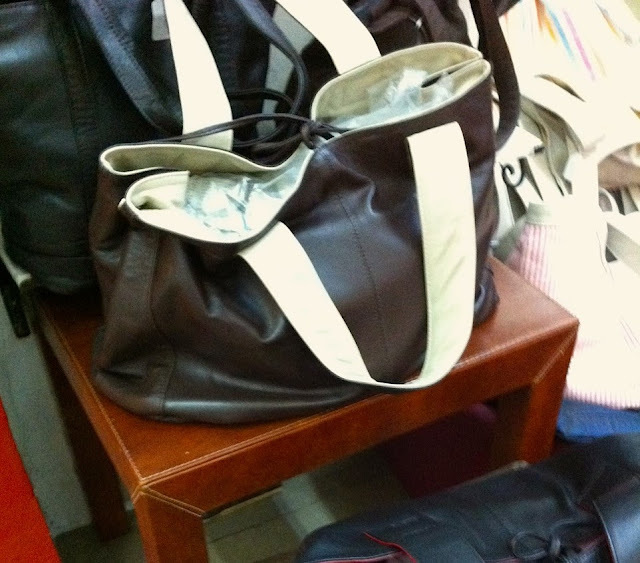 These handbags are totally reversible and made with the softest glove quality leather. 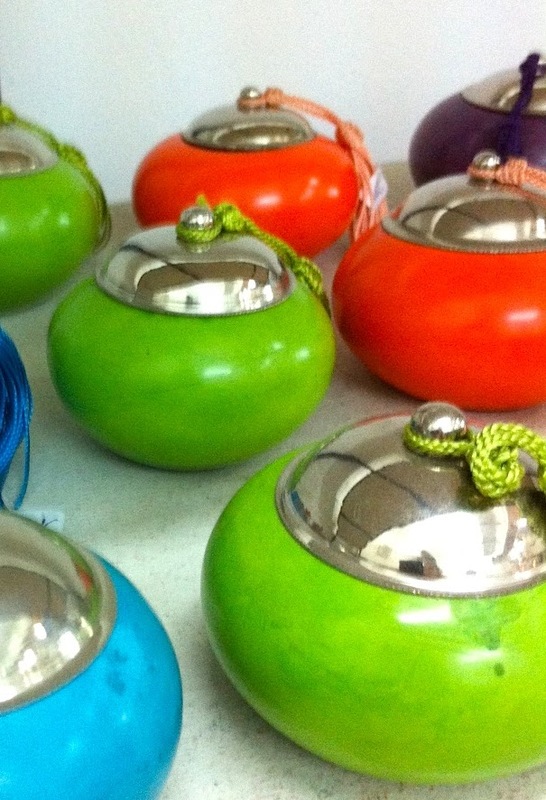 They are light and come in a variety of colour combinations. Ces sacs sont entièrement réversibles et fait dans un cuir à gant d'une douceur infini. 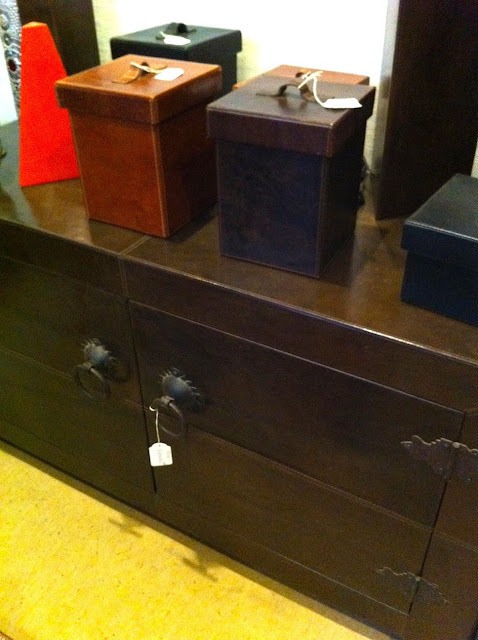 Hassan even covers furniture and boxes with leather and uses antique handles and hinges to give them a unique modern/antique look. The craftsmanship is remarkable and each piece is hand made. Hassan recouvre même des meubles et des boites de cuir et les orne de poignées et charnières anciennes pour un effet moderne/ancien. La qualité du travail est remarquable et chaque pièce est entièrement faite à la main. 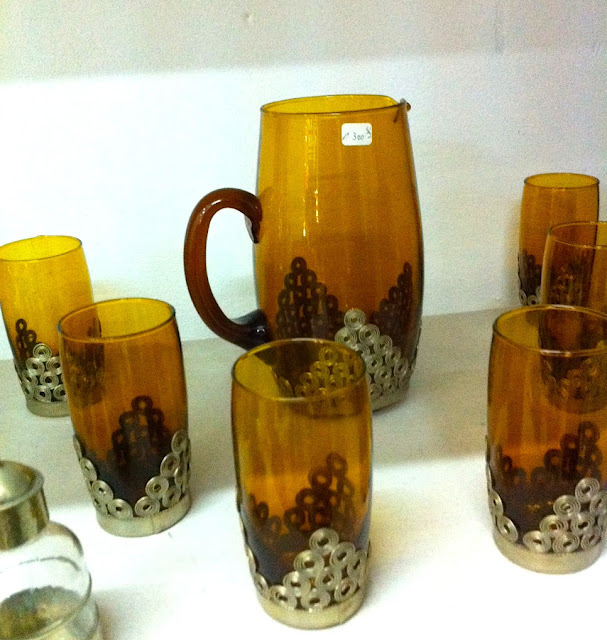 ...as are these vases and salt and pepper shakers. ...il en va de même pour ces vases et salières, poivrières. 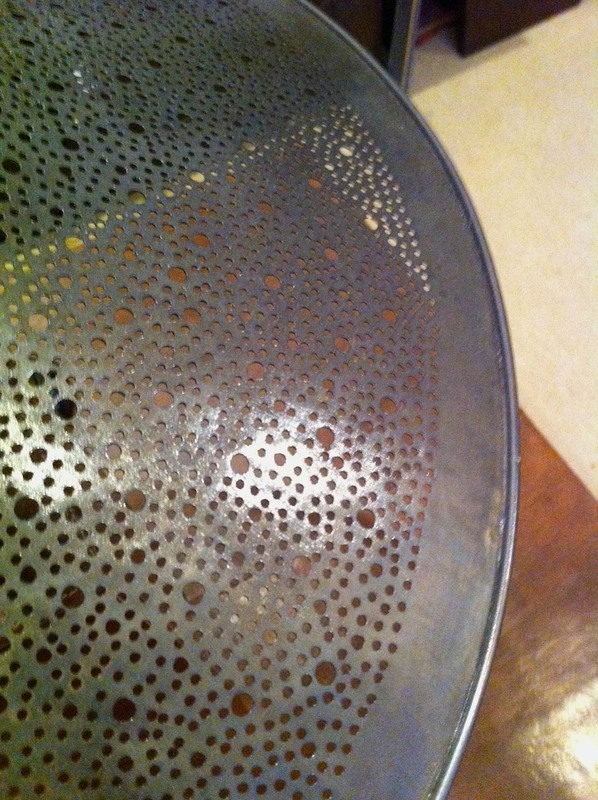 The mill work for these lamps is done entirely by hand and the holes in the metal lampshade are punched out one by one by hand: hours of work! Ces abats-jour sont martelés et percés à la main. Des heures de travail! ...and in the school uniforms on young girls. If you want to know what the word indulgence means, go to Las Chicas for dessert (https://www.facebook.com/laschicasdetanger ). 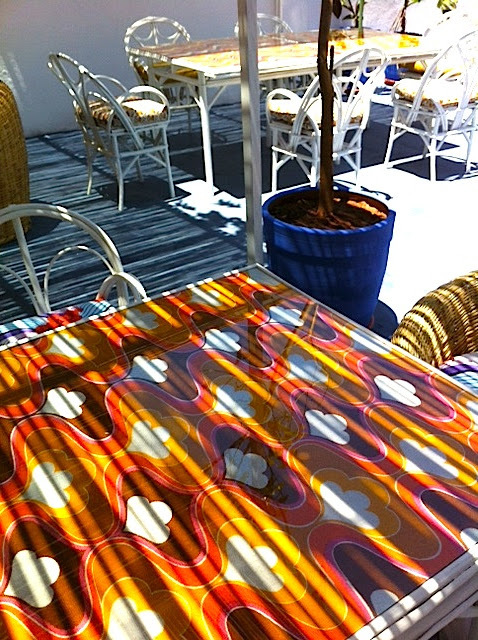 Above the two-floor store is a sunny terrace wth a definite Morocco-in-the-sixty's look. Si vous voulez connaitre le vrai sens du mot gourmandise, allez au "concept store"/restaurant Las Chicas et goûtez aux désserts. Au dessus des deux étages du magasin se trouve une terrasse dans le style Maroc dans les années 50. Talent runs in Aïda's family. She runs Las Chicas with her business partner, Yasmin. Her mother is a well known award winning Moroccan film producer. 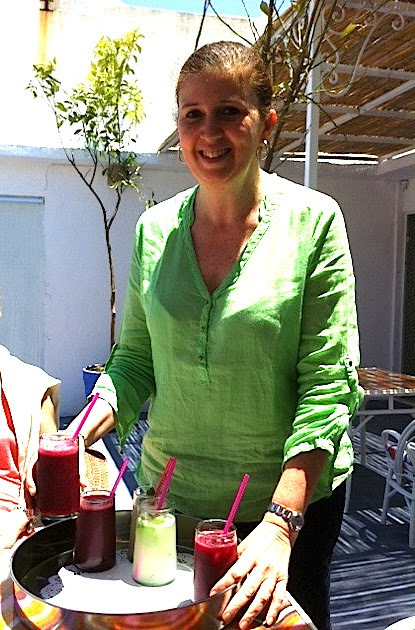 To quench your thirst on a hot day, start with one of the fabulous fresh juices Aïda makes. Aïda dirige le magasin avec son associée, Yasmin. Le talent est une affaire de famille chez Aïda: sa mère est une célèbre productrice de cinéma marocaine. Pour vous désaltérer, commencez par un des incroyables jus frais que prépare Aïda. Red beet and orange, or lemonade with grated ginger. To die for. 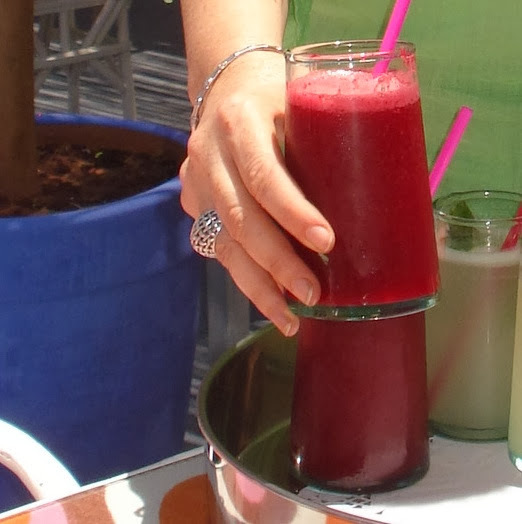 Betteraves rouges et orange ou jus de citron au gingembre frais. À mourir tellement c'est bon. 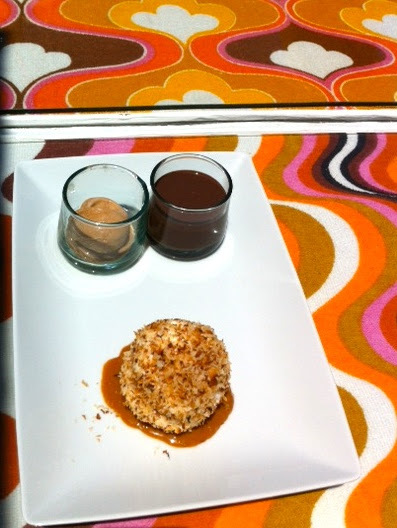 This caramel-chocolate combo was criminally good: caramel ice cream, chocolate mousse and a "surprise", a nut covered meringue-y cake with salted butter caramel cream. Everything I like on one plate! Le dessert chocolat-caramel est un crime de délice. : glace au caramel, mousse au chocolat et la "surprise", une meringue roulée dans des brisures de noix et recouverte de crème au caramel salé. Tout ce que j'aime dans une seule assiette! This is the fruit version: cherry sherbet, raspberry coulis and a meringue-chantilly marvel with cherries on top, called a "pavlova". Did you say bliss? 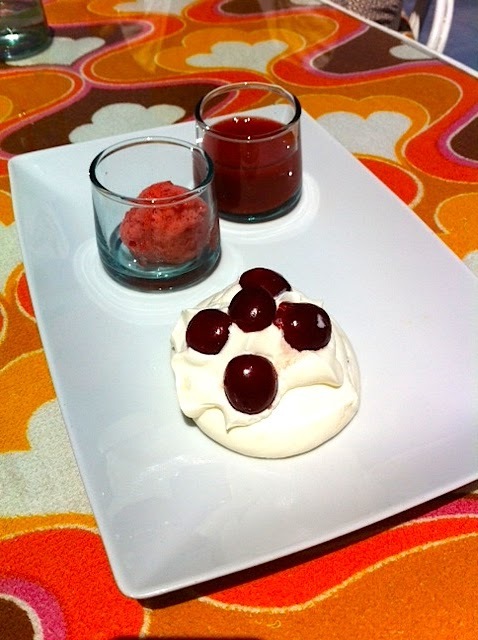 La version fruits rouges: sorbet à la cerise, coulis de framboise et "pavlova" aux cerises confites. Vous avez dit bonheur? 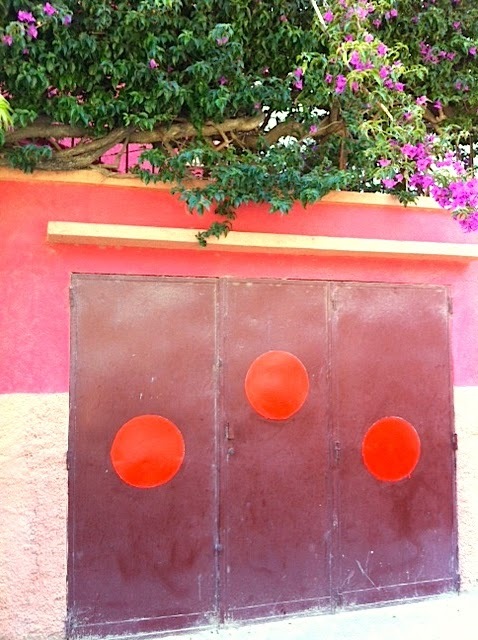 Moroccans are very proud of their houses and go to great length to decorate them inside and out. 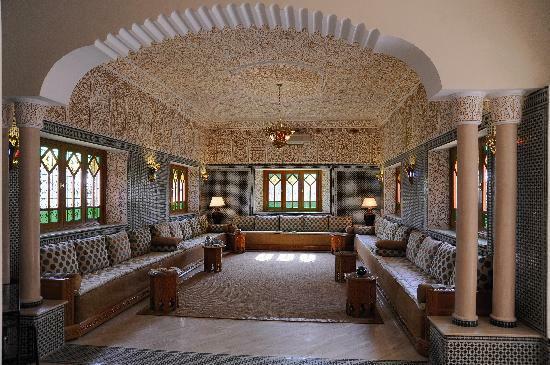 Moroccan decor is everywhere of late: traditional black on white Beni Ouarin carpets adorn every other home in magazines as do zellijs tiles (see a previous post: The zellij of Morocco) used on kitchen back-splashes and bathrooms. 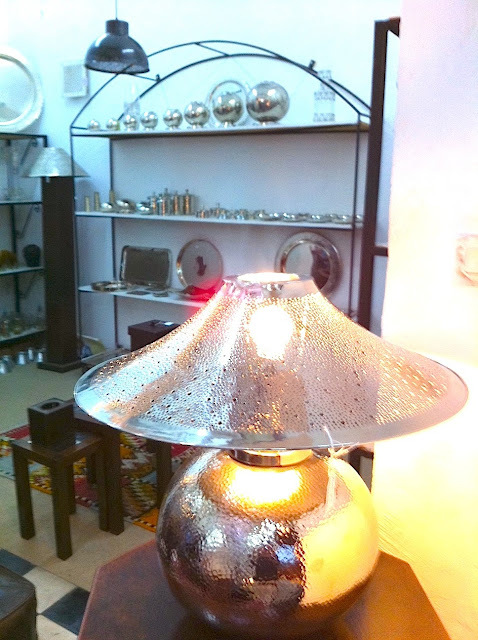 Hand-hammered metal lamps are painted and hung in groups for extra effect. 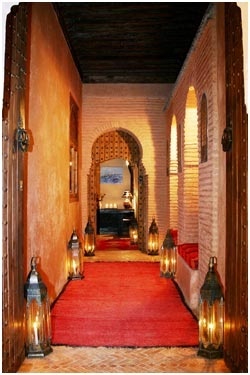 However, one must differentiate between traditional moroccan decor and Morocco-inspired interior design. In Morocco, most if not all entertaining is done at home. A traditional living room must be big enough to accommodate large families and numerous friends. Typically, there is a wrap-around sofa and small tables placed here and there in front of it. The walls are often lavishly decorated and the fabrics always rich and colourful. There is often no formal dining room and guests sit all around the room for dinner. Food is served on the small tables, sometimes in big tray-like dishes where everyone digs in. When you enter a house for the first time, you are offered warm milk (almond, goat or camel depending on the region) and some dates as a sign of welcome. You will also drink mint tea, what locals call "Moroccan whiskey". In more modest houses the long sofas also serve as beds and every room is called a "salon" (drawing room) even if used as a place to sleep. 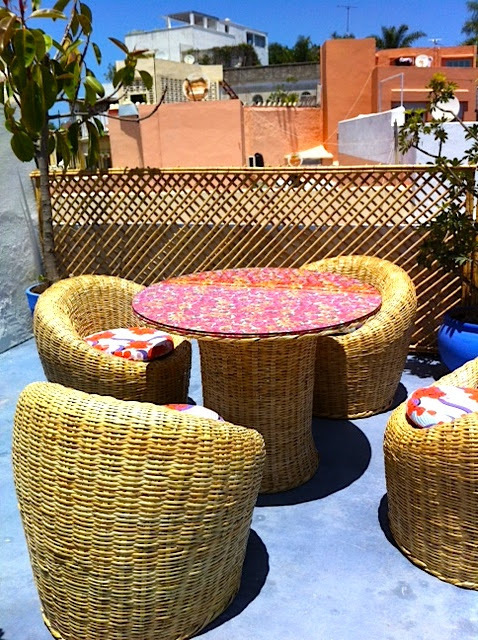 We once arrived early for lunch at a Moroccan house. We did not understand that "midi" (noon) meant well after one o'clock in the afternoon. We found some members of the family still sleeping on the sofas while the grandmother prepared the meal. Once they got up and cleared the sofas, we all sat down for a delicious chicken and vegetable couscous at around 2:00. No plates, everyone ate with their fingers from the serving dish. We were given spoons (it must have been the puzzled look on our faces). It was one of the best meals I have had in Morocco. 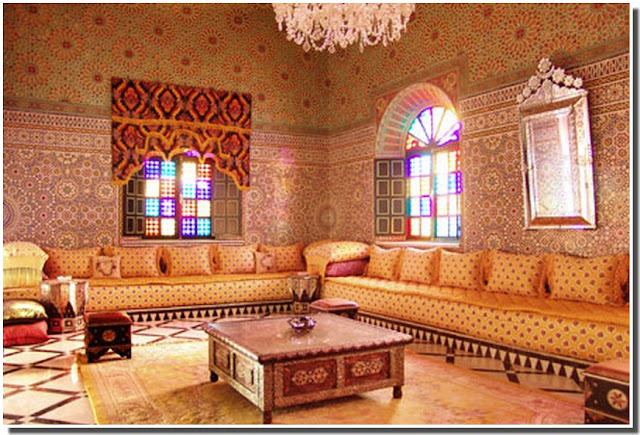 Then there is Moroccan style: the interpretation by non-Moroccans of Moroccan decoration. 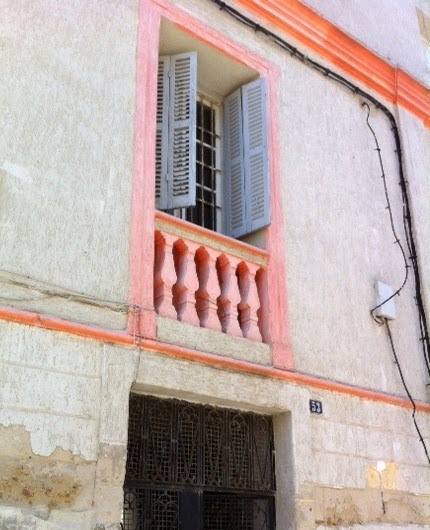 It can be a simple architectural detail as below. 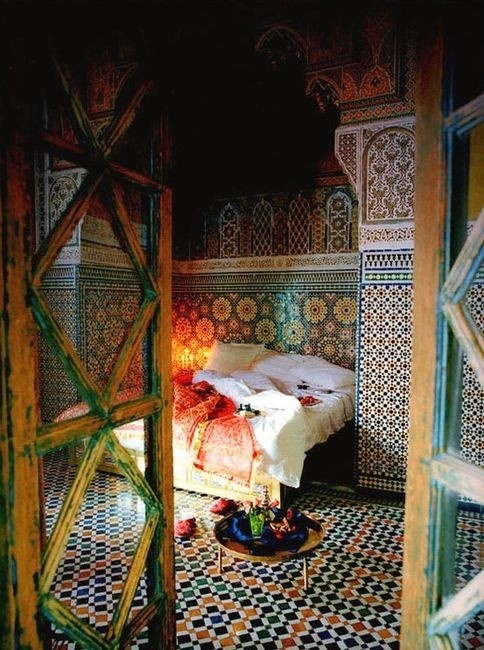 If it were not for the white scalloped transom, this could be a room anywhere but that doorway and reading nook give the room a Moroccan "ambiance". 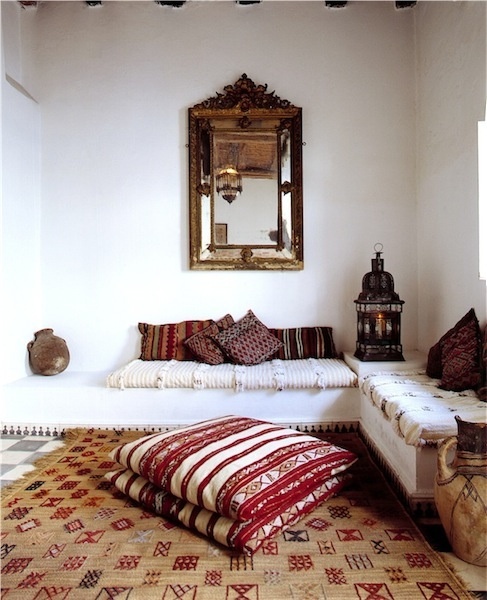 Sometimes a few pillows and a lamp will be enough to feel that you are in Morocco somewhere. 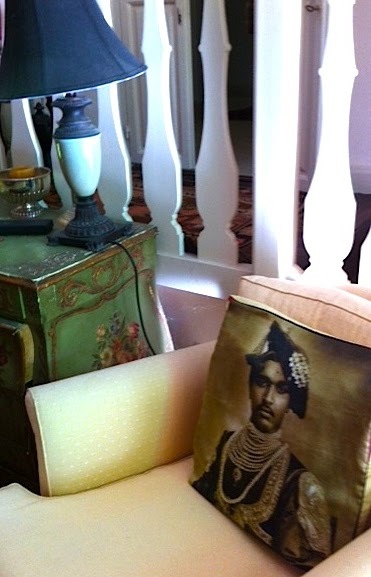 A hanging lamp, a colourful Moroccan carpet and a pompom-edged wool bedspread will have the same effect. 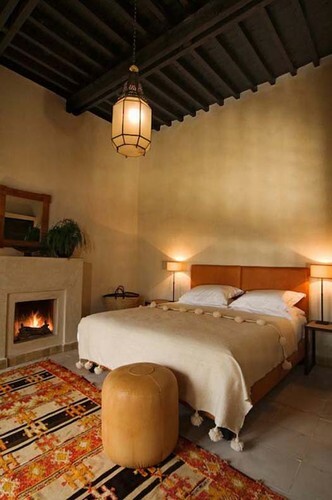 The headboard, table lamps and fireplace are very modern but the room gives off a distinct Moroccan feeling. Get the full effect with architectural elements like the arched doorway, the thick nail-studded wood doors, the floor lamps and the red Moroccan runners on terracotta tiles known as bejmat. Or go for broke and cover the walls and floors with rainbow coloured zellijs. 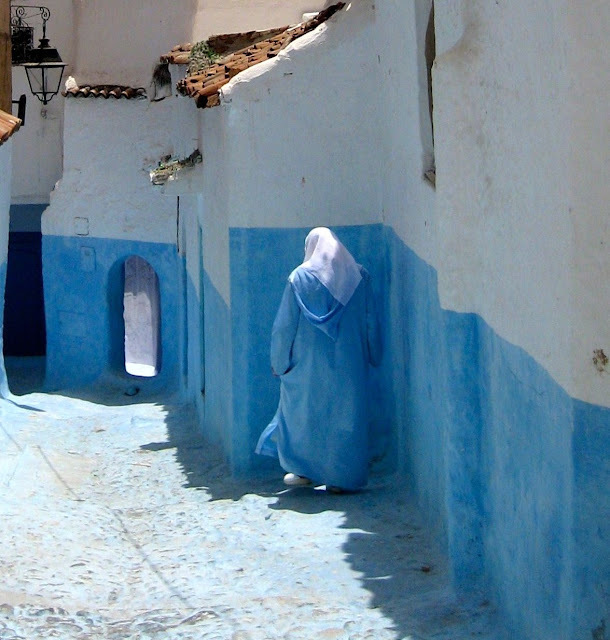 Chefchaouen, or Chaouen as it is commonly called, is also known as the blue city because its walls, streets and even flower pots are painted with a mixture of lime and the pigment of the anil plant called indigo. More or less anything that does not have a heartbeat gets a coat of blue paint here. 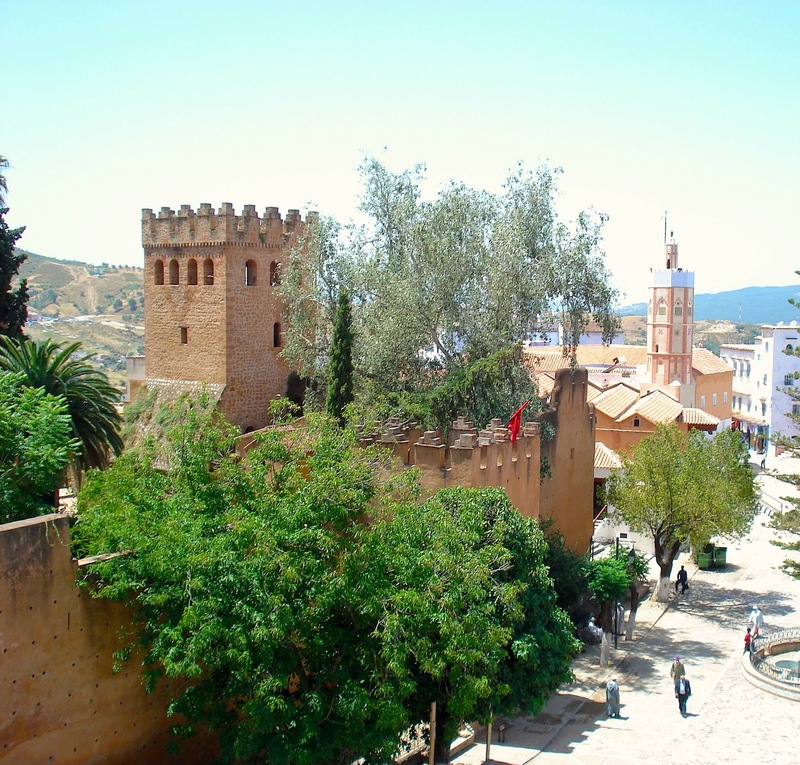 Chaouen sits inland in the Rif mountains an hour and a half by car from Tangier and is a popular tourist destination not only because its colour is so striking but also because its medina is full of treasures begging to find a home. This local woman takes her city's colour theme very seriously! Indigo has insecticide properties and what started as a way to repel insects, became the symbol of the city. 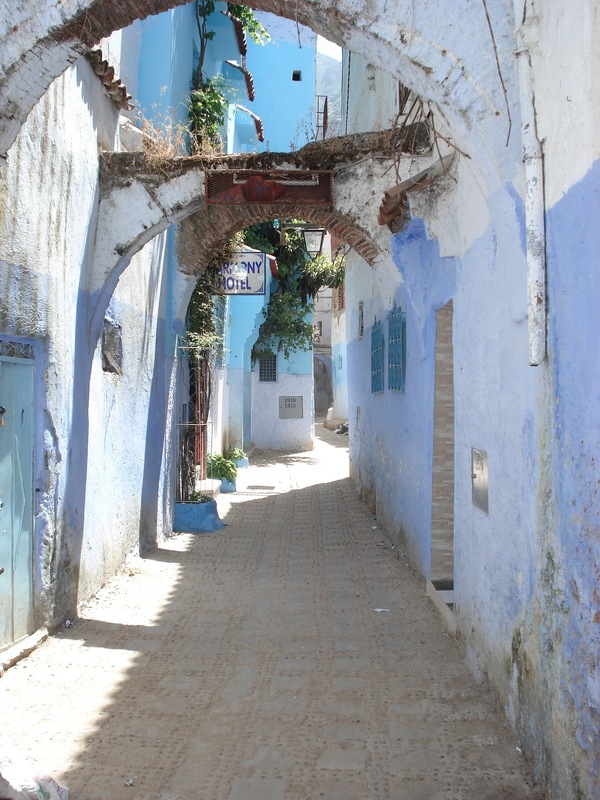 The small streets and alleys are a study in shades of blue from pale sky-blue to deeper hues and from purplish to greenish turquoise tones. The effect is striking and a great source of pride for the inhabitants of the city. In a sea of blue, this hotel's stucco wall with intricate window frames and yellow fountain stands out. 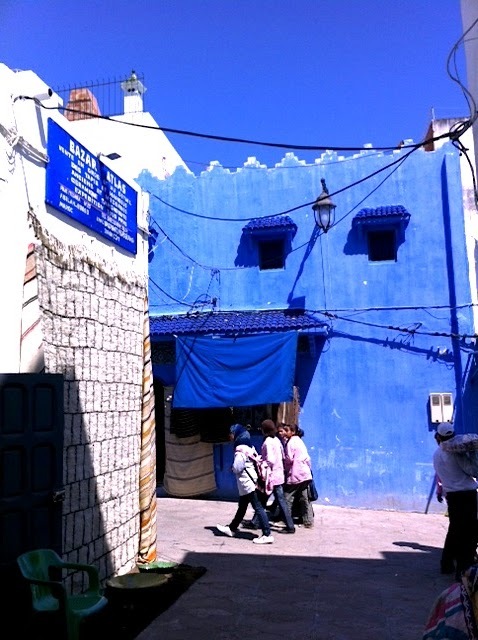 Inside, in the patio, there is just enough blue to remind us that we are in Chaouen. Note the motif on the arches on either side of the entrance. 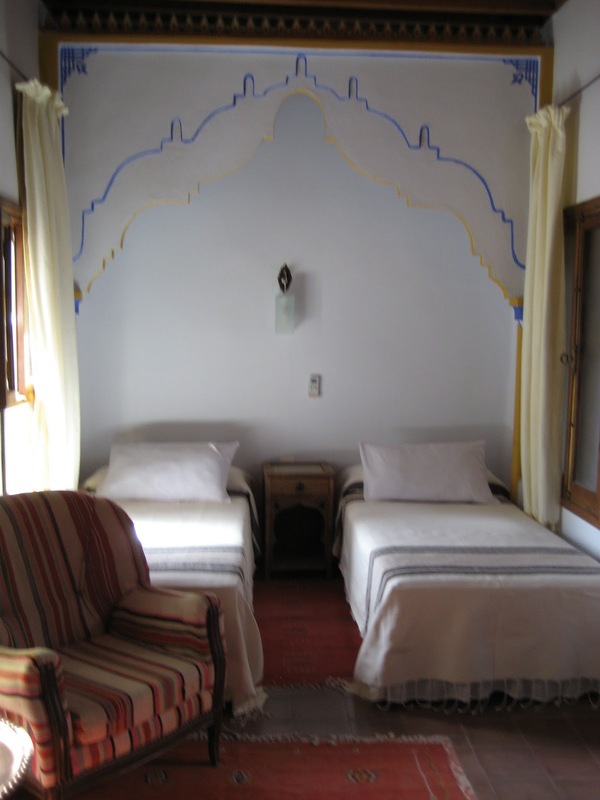 The motif from the arches in the patio is carried over to the niche in the bedroom wall as is the blue theme of the city. This elegant detail gives the modestly decorated room an inimitable Moroccan flair. 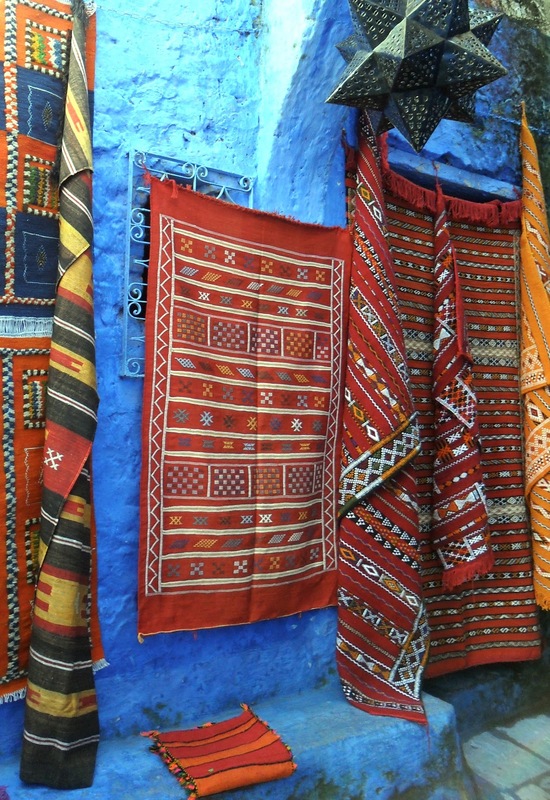 Chaouen is also known for its wool production and blankets and rugs are made locally. One can see the weavers at work around town. 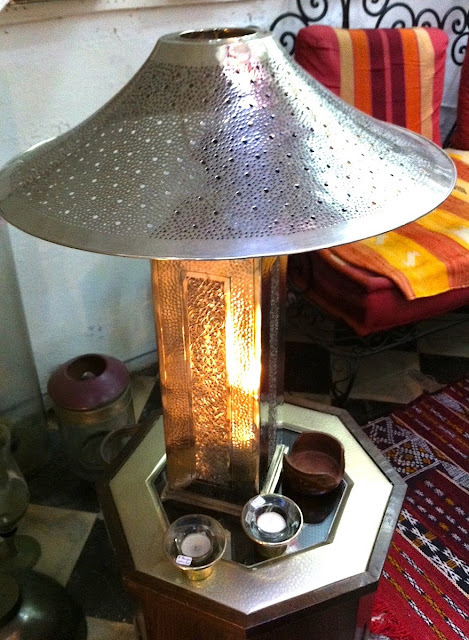 Other locally made items such as this magnificent dark metal star lamp are for sale. Also for sale are soaps, spices and fragrant essential oils at the "pharmacie berbère", the local tribal "pharmacy" that specialises in remedies for everything and anything that ails you even, they claim, unrequited love. The old fort was built in the 15th century by a sultan to repel the Portuguese invaders. In the 1920's during the Spanish protectorate of Morocco, it was used as an administrative building and served as a prison for, among other unfortunate souls, an uncooperative sultan. Temperatures rise to boiling point in the summer and a stay in the prison could not have been what dream vacations are made of. The tower has been restored and is now a museum. The ocher colour of the centuries-old fort brings a soothing contrast in the all blue city.